It's tricky to characterise the story the Nintendo Wii U as anything but a sad one, at least if you're a Nintendo fan. There's nothing wrong with the console per se, but it has taken an age for the Japanese company to provide it with a credible library of games. 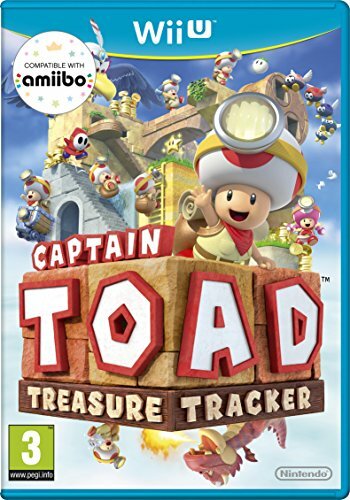 Something that now, as we move into 2015, it has succeeded by adding titles like Captain Toad: Treasure Tracker to the swathe of other Nintendo franchise titles over the last year. The story of the Wii U hasn't reached its conclusion yet, indeed December 2014 saw its highest uptake yet. Although it will unlikely ever be seen as a success - in number terms anyway; it's taken two years to shift 7 million units, whereas over 100 million original Wii consoles were snapped up - games like Captain Toad: Treasure Tracker, a spin-off from Super Mario 3D World, shows there's life in the console yet. If you've played Super Mario 3D World, which contained a smattering of levels in which you played as Captain Toad, controlled via the Nintendo GamePad, then, as such, you've played Treasure Tracker before. So is it worthy of being a game in its own right? The game does reek a bit of Nintendo's desperation to get any sort of Wii U exclusive on the shelves. But it feels in no way like a bodge: the blueprint set by those Super Mario 3D World levels has been fleshed out and expanded with all the aplomb you would expect from the Nintendo of old, and it displays plenty of polish. Nintendo's mojo is returning. Toad isn't the most memorable or talented of Nintendo's myriad characters - indeed, the gameplay hinges on the fact that he can't really do very much at all. He can walk, walk ever so slightly faster if you hold down the A button, pull turnips out of the ground, throw them at enemies and, er, that's about it. He can't even jump an inch and, since Captain Toad: Treasure Tracker confronts you with a vast procession of gloriously arcane and impressively vertical levels, each containing three jewels to collect and a gold star to bring about completion, you must expend a certain amount of brain-power in order to prosper. Inventive puzzles abound, and as in Super Mario 3D World, the level-design is breathtakingly good. Each level has a distinct feel, and many reference Super Mario 3D World: you find familiar tropes such as the cherries which allow you to clone yourself, blocks which start to dissolve when you step on them, or appear until the end of a musical phrase, wheels you must negotiate like spinning logs and so on. Classic enemies like Bullet Bills, Boos and Goombas abound. There's some variation, too: some levels take place in mine-carts full of turnips, which you aim by moving the GamePad around, and can fire at surrounding objects. Sometimes you can touch blocks on the GamePad to move them around, and you often find lifts powered by blowing into the GamePad's microphone. You can stand on spin-wheel blocks and ratchet them around, to rearrange parts of the level, by tracing circular motions on the touch-screen. At last, decent use has been made of the GamePad's unique properties. There are boss-battles, too, featuring a lava-dwelling dragon and a giant bird, which mainly involve dodging attacks and quickly performing block-rearranging actions. Like the rest of the game, these have a peculiar and distinctive logic to them; at times, there's often a real MC Escher feel to proceedings. Despite a false ending (in which the credits roll), Captain Toad: Treasure Tracker is a pretty meaty game, boasting over 70 levels, including bonus ones taken straight from Super Mario 3D World, which are straightforward coin-collecting exercises. Collecting jewels you missed provides a decent level of replayability. Captain Toad: Treasure Tracker isn't perfect: the relentlessly jaunty music will drive you round the bend, and playing as Toad or Toadette, who communicate only in squeaks, often descends from cutesiness into tweeness. Plus the game never becomes as fiendishly challenging as the likes of Super Mario 3D World, which could be a good or bad thing depending on your outlook (and, perhaps, your age). But it's a level design tour de force, looks great and, while thoroughly suitable for young kids, places sufficient demands on spatial awareness and ability to reason logically that adults will find themselves sucked into it too. Which is exactly what Nintendo games should be all about. It's a shame Treasure Tracker wasn't around in 2012 when Nintendo was trying to get gamers to commit to the Wii U and its touchscreen-based GamePad controller. Today the console landscape has changed, with the PlayStation 4 and Xbox One boasting lots of great titles, but nothing like Captain Toad: Treasure Tracker. It's distinct, fun and, daresay, Toadally awesome.